With the team's first ever F1 season all wrapped up, the 1986 season was going to be even more difficult than the first one. As so often in Minardi's history, the problems were of a financial nature. Several sponsors had pulled the plug. 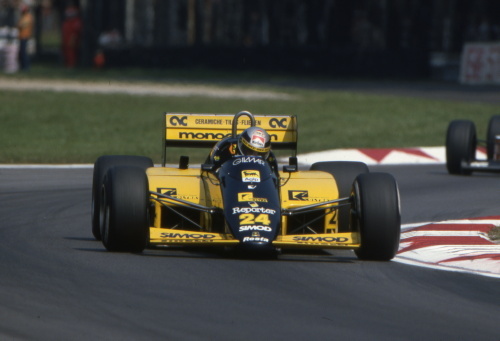 Nevertheless, Minardi had made good contacts in F1. The team was given permission to use Ferrari's test track at Fiorano and got technical aid from FIAT who allowed them to use their Abarth R&D facilities. In addition it had forged closer ties with its tyre supplier Pirelli. 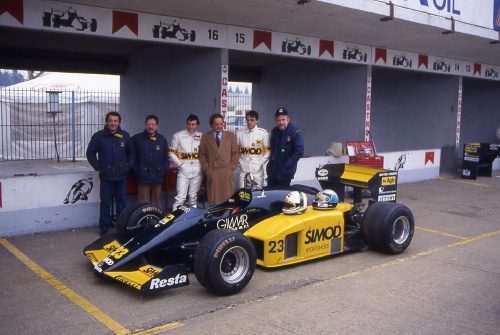 The team's 1985 driver, Pierluigi Martini, had returned to F3000 and was replaced by Alessandro Nannini and Andrea de Cesaris, the latter bringing much needed cash in the form of sponsors Marlboro, Simod and Gilmar. The team started 1986 with a modified version of the M185, the M185b. The M186 was ready halfway through the season. Minardi's engine had undergone some development and now clocked up 830 hp. The main problem, the engine's notorious thirst, still hadn't been solved. This put off potential buyers for the engine and Minardi faced the entire R&D bill for the new Motori Moderni unit. Motori Moderni insisted that the consumption problem could have been solved, had more money been available. Apart from the engine issues, Minardi's new ultra light gearbox caused a string of problems. At the Mexican GP the team enjoyed its first ever double finish with de Cesaris coming in 8th and Nannini in 12th position (out of 16, only two laps behind race winner Gerhard Berger). For both cars it would be the only chequered flag that season. That the package would have been competitive, had it not been for reliability issues, was shown by the team's good qualifying performance which culminated in de Cesaris' excellent 11th spot on the starting grid for the Australian GP. 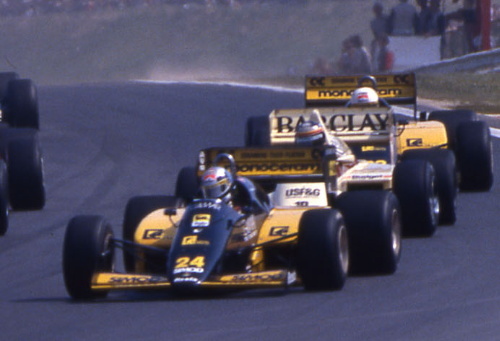 The team made headlines during the British GP, when Thierry Boutsen's Arrows crashed into the Minardis in a first-corner scuffle. Nannini's rear suspension was considered irreparable but the team's mechanics managed to fix the car in time for the restart. It was a brave effort that received a lot of media attention.